As the weather keeps getting colder I become more and more obsessed with trying hand creams - believe me, I've tried a bunch! Many are just too light for this kind of cold weather, some smell awful and there is no way I could stomach them and some are so greasy feeling that I felt like I was leaving slug trails everywhere I touched. These 3 I liked and better yet are all in the $12 - $20ish range - so they are also very affordable! 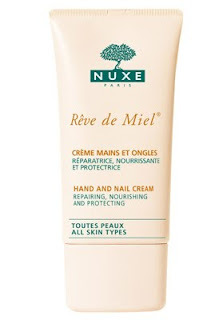 Nuxe - Hand and Nail Cream - 75ml - Thanks to the Chilean rose, avocado and almond oils this cream is super moisturizing and thanks to the honey it smells sooooo good. It absorbed nicely and didn't leave residue behind. I was also pleased to find out that they have a body cream in the same line which has the same scent! Available at Shoppers Drug Mart and The Bay. 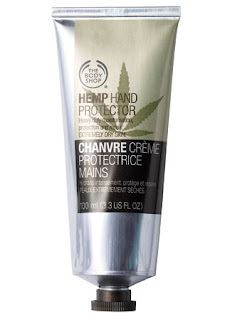 The Body Shop - Hemp Hand Protector - 100ml - So this cream actually has 2 of the 3 unfavourable qualities that I mentioned above and yet, works so well that I use it anyway. It smells horrible and leaves greasy marks all over everything! But it is so freaking moisturizing that I must forgive it! My solution to its shortcomings is to wear it overnight with cotton gloves on. Not only does it give you that formal bedtime look that your husband will appreciate (mock), but when you wake up in the morning your hands will be so incredibly soft, you will be amazed! This is a great trick with any hand cream as well as doing the same for your dry feet with cotton socks. 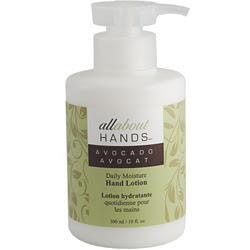 Upper Canada Soap - all about Hands - Avocado Daily Moisture Hand Lotion - 300ml - the least expensive and the biggest bottle. I like avocados for their moisturizing effect and this lotion doesn't disappoint! It soaked in quickly and didn't make slug trails. Available at selected gift shops, The Bay and Sears. As always, I will keep on trying out hand creams for your amusement!